Uniformed officers stand across the street from protesters in Denver, Colorado, on Friday morning after troopers cleared protesters from a park. Editor's note: The following are updates on Occupy Wall Street-style protests in the United States, including those in Denver - where some protesters were detained Friday morning - and New York, where authorities arrested some marchers after city officials canceled a plan to clear demonstrators' encampments at a city park. [Updated at 12:32 p.m. ET] In San Diego, CNN affiliate KFMB broadcast images of police detaining demonstrators as they gathered amid tents and tarps strewn about a downtown plaza. Protesters appeared to refuse to leave the area, sitting in columns atop the tarps and yelling, "Stay down" as police tried to remove them from the scene. Police had warned the protesters to leave the area by Friday. They told protesters they were violating a city ordinance by setting up tents in a public area without a permit, and that they were in the way of a planned weekend event that is expected to draw hundreds of people in the same area, CNN affiliate KGTV reported. The mayor said on New York's WOR Radio that he didn't know which officials allegedly made the threats, but that the company decided to work out some form of a negotiated settlement with protesters in the coming days. Bloomberg added that while he lacked first-hand knowledge of the conversations, he was told the officials generally threatened to "make life more difficult" for the real-estate company. [Updated at 10:25 a.m. ET] Fourteen people were arrested Friday morning on or near Broadway in lower Manhattan, including protesters who obstructed traffic by standing or sitting down on the street, New York Police Department Deputy Commissioner Paul Browne said. Other people who were arrested had turned over trash baskets, knocked over a police scooter and hurled bottles, said Browne, who added that charges were pending. Demonstrators were marching on Broadway on a day that city officials decided not to follow through on a plan to clear protesters from lower Manhattan's Zuccotti Park, where protesters have been camping for weeks. [Updated at 10:08 a.m. ET] At least 24 protesters were arrested - many on allegations of criminal misconduct - in Denver, Colorado, on Friday morning as state troopers cleared people from a park where protesters had been encamped, CNN affiliate KMGH reported, citing Denver and state police. [Updated at 9:25 a.m. ET] Some protesters in Denver, Colorado, were detained Friday morning as state troopers began clearing them from a park where they'd been encamped, CNN affiliate KMGH reports. 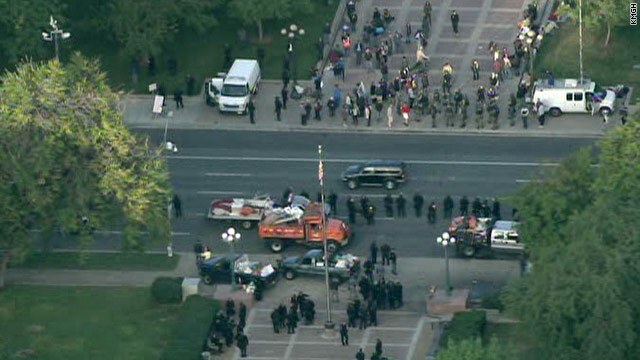 Authorities had given protesters until 11 p.m. Thursday to clear the park, which is across the street from the state Capitol, KMGH reports. Video from the scene, provided by KMGH, shows a few dozen protesters shouting toward a line of uniformed officers across the street from them. Troopers were preventing protesters from returning to the park. [Updated at 8:59 a.m. ET] The real-estate firm that owns New York's Zuccotti Park - where Occupy Wall Street protesters have been encamped for weeks - decided not to clear out protesters as planned Friday after the company was "inundated" with calls from public officials who threatened them, New York Mayor Michael Bloomberg says. Bloomberg said during his weekly commentary on New York's WOR Radio that he didn't know which officials allegedly made the threats, but that the company decided to work out some form of a negotiated settlement with the protesters in the coming days. Updated at 6:28 a.m. ET] The New York City mayor's office says a cleaning planned for Manhattan's Zuccotti Park, where Occupy Wall Street protesters are encamped, has been postponed. The move averts a potential showdown between demonstrators and police. The New York mayor's office said Brookfield Properties, the owners of Zuccotti Park, told the city late Thursday the scheduled cleaning is off for now and "for the time being" they are "withdrawing their request" made earlier in the week for police assistance during the cleaning operation. There had been fears of a standoff between New York officers tasked with clearing the park early Friday and protesters who wouldn't budge. The city had ordered the protesters to leave by 7 a.m. so crews could clean the park. [Posted at 3:18 a.m. ET] Protesters camped out at a Manhattan park say they have no intention of vacating it despite an order from New York Mayor Michael Bloomberg to leave the premises by 7 a.m. Friday to allow for cleanup. "We will passively resist and make it as difficult a process to remove us as possible," Occupy Wall Street spokesman Tyler Combelic said Thursday. "It's not an occupation if you can't occupy the park." His words appeared to be backed up by the sentiment of the crowd of more than 1,000 protesters who filled Zuccotti Park Thursday night. "All day! All week! Occupy Wall Street!" they chanted. Combelic called the mayor's announcement a "not-so-veiled attempt" to force protesters from the park, setting up a possible confrontation with authorities. Protesters descended on the privately-owned park near the New York Stock Exchange on September 17 to protest the nation's ailing economy. Filed under: Economy • Justice • Politics • U.S.
hey banasy the protest rally was ABSOLUTELY AWESOME! The protestors have been given the use of circus park 4 tent city & the plan is camp out for 60 days. No violence so far & bigtime support by city officials & police! Makes l proud to be from detroit! I get a post in your cabinet? And city officials and police are behind you? I used to like Obama and his ideas... but then he became too associated with the jewish religion and all of a sudden he didn't like arabs or muslims anymore. this is wrong. he's black... but not like a black. How can the Americans talk about a financial crisis when America is pouring millions in idle projects in countries listed as the most corrupt? Look at this story http://thecomingcrisis.blogspot.com/2011/09/nceg-and-usda-project-big-fraud-that.html. Either this crisis is artificial or the American public is terribly ignorant of where there tax money is going. I'm really starting to believe that there is a clique on these blogs whose purpose is disruption. Some are pretend ind to be friends, some enemys, but all being disruptive of the purpose of the blogs. WHITES AREN’T WELCOME IN AMERICA ANY LONGER !!! WE DON’T NEED YOU ANYMORE !!! OUT OF AMERICA WITH WHITES NOW !!! OBAMA'S HEALTH CARE RECORDED LIVE IN 2009. Facts about lunatic Obama/Bush's twilight zone administrations(HORROR) or genocide against white population. THIS INFORMATION WAS PROVIDED TO YOU BY WHITE AMERICAN REFUGEE !!! FOR PIECE OF MIND(sanity), PLEASE VISIT MY WEBSITES AND REMEMBER, GENOCIDE(health care)﻿ BASED ON FORGIVE﻿ AND FORGET IS NOT FOR ME !!! DIGNITY, PRIDE, AND HONOR ARE WORTH TO DIE AND KILL FOR !!! THEY WERE MURDERING YOU WITH AND INSIDE OF THEIR CORPORATIONS FOR OVER 66 YEARS !!! THEY HAVE CLOSED DOWN ALMOST EVERY SMALL COMPANY IN UNITES STATES OF AMERICA AND NOW, THEY WANT YOU TO GO OUT THERE AND PROTEST FOR THEM AGAINST WALL STREET(corporations = Wall-street) !!! FOR ENTIRE 66 YEARS, ON DAY TO DAY BASES, ALL THEY WERE DOING IS CRIME CONTEMPLATING AGAINST US INSIDE OF THEIR BACK OFFICE CUBICLES(on job torture/bullying/mobbing and forceful unemployment to progress humanity as Obama exclaimed over and over) PER EEOC AND NOW, THEY WANT YOU TO RAISE COMMUNIST FLAG UNDER AMERICAN SKY !!! ONE RACE; RAT RACE(Wall street protesters are Obama's army which spread from London per Zionist Washington DC and communist Moscow) !!! WHEN YOU PROTEST(it is much more than just than necessarily), RAISE SIGNS HIGH SO WHOLE WORLD CAN SEE DISPLAYED I CITE, "66 YEARS OF GENOCIDE AGAINST WHITES IS NO LONGER ACCEPTABLE !!!"